Onion Soup made with thyme, onion, black pepper, garlic, grated cheese, bay leaf, chicken stock, butter and margarine. Peel the onions. Halve lengthwise and cut into very thin slices. Cook in the fat over a low heat for about 30 minutes. Add a dash of sugar which gives colour and flavour. Add the crushed thyme and 1 whole bay leaf. Sprinkle over a little wheat flour if you like a thicker soup. Add the stock and cook over a low heat for 2 hours. Season with salt, pepper and bring soup to the boil. 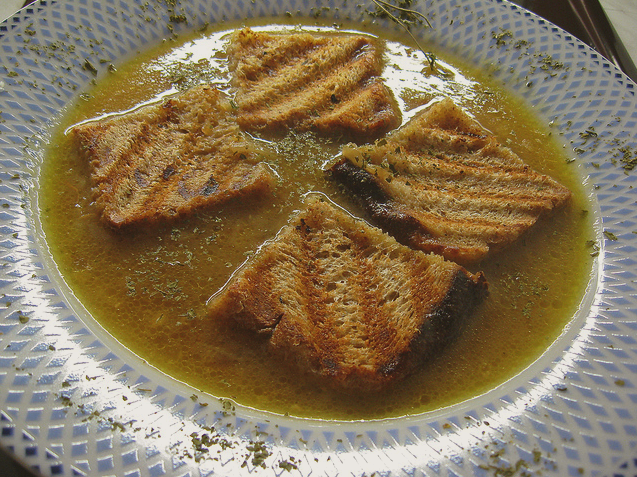 Pour into soup bowls and serve with bread and cheese separately. Bake the bread slices or cubes of bread in the oven first (they can be brushed with olive oil and garlic). Pour the soup into heatproof bowls, sprinkle cubes of bread or place a large slice of bread in each bowl or in a large bowl, sprinkle the cheese and gratinate under a hot grill or the oven untill golden brown.